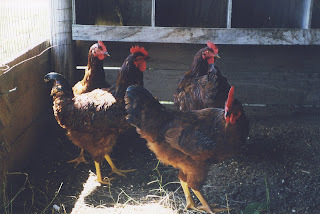 Elizabeth Ann's Recipe Box: MORE chickens???? "Elizabeth, turtles belong outside." "No, we will not buy you a two thousand dollar parrot." "That cat has mange! Get it out of your bedroom." "MORE chickens??" "HOW many puppies are you bringing home?" "Elizabeth, you may not bring anything home that breathes without calling first." 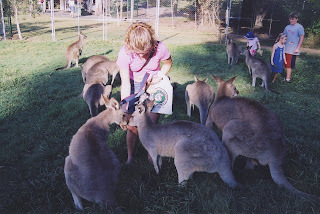 My love for animals started early. 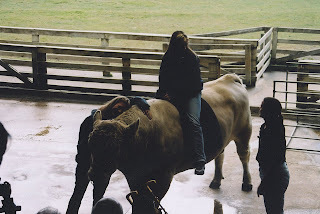 I remember riding a massively big horse every time I went to my Uncle Johnny and Aunt Lucy's farm. (I found out in college, I was really riding a Shetland Pony) But my love for animals was not entirely cultivated on my own. . . my daddy was always there to spur me on! 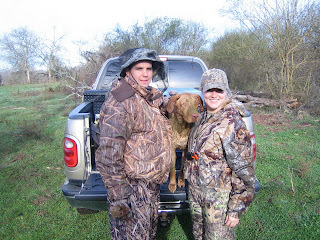 One of my first "animal" memories was Daddy catching ducks for us at Conroe so we could pet them. 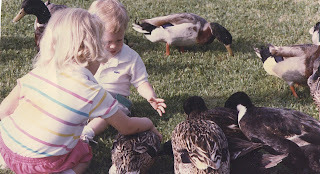 Feeding the ducks was a highlight when we visited Gigi and Pop's lake house! Daddy also used to bring back Horny Toads for us every time he went hunting in South Texas. I loved those little lizards and am sad that they are endangered. Both of my parents taught us to have a compassionate heart for animals, but I learned early, that DAD was the one to go to when I wanted to keep a pet I had found! Mr. Baker had a birthday party at his farm when I was really little. Each family invited was supposed to bring a farm animal for him. It was so much fun for all the kids when Mr. Baker opened each "crate" to see what animal would come out! I was in HEAVEN! Recently, I thought that if I am so blessed to have a ranch some day, that would be my DREAM birthday party! (hint hint) One of my FAVORITE animals the Baker's had was their pet goat, JOB! Dad would take me with him to the Baker's ranch when he went fishing but we would always have to stop to get carrots on the way so I could feed the horses! At Second Baptist in third grade, each class hatched chickens from eggs in an incubator. I am sure you can imagine 20 3rd graders excitement when the chicks finally started to peek out of their shells! Well, of course I HAD to take my two chickens home with me. Luckily Mom and Dad allowed me to keep my chickens in the backyard in our Memorial home. Dad would catch June bugs at night and feed them to the chickens by hand. Needless to say, my chickens had a pretty ritzy life. How many chickens are hand fed bugs?? The time came when they started crowing and we took them to Uncle Johnny and Aunt Lucy's farm. I wasn't as sad when I saw the chickens running around eating as many grasshoppers as they could catch! They were pretty funny! I rode when I was little but didn't have horses so it was sporadic. I found a beautiful horse in a magazine when I was really little and kept the picture well into college JUST in case anyone wanted to know what kind of horse I wanted! :-) I remember watching National Velvet and totally identifying with Velvet's overwhelming desire for her own horse! When I was 11, I went to Camp Waldemar and got to ride 2 hours every day! There was an elite riding group called Connie's Cowgirls and my counselor told me that if I worked REALLY hard, I could make it into that group and ride for 4 hours every day! I worked so hard and memorized (literally) every part of the horse anatomy (which i have completely forgotten now!) and made it into Connie's Cowgirls! I was probably one of the only girls who didn't have my own horse and was probably the least experienced rider. . . but I tried my best every time and it paid off! 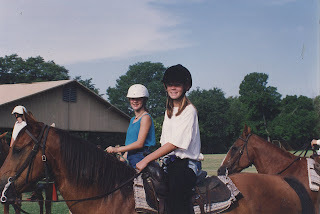 I took riding lessons for a while after I quit going to Waldemar, but high school got in the way. I still love riding but, again, it is sporadic! I hope one day to have a ranch and be able to have my very own horse! Since I have waited so long, I think I will appreciate it so much more!! 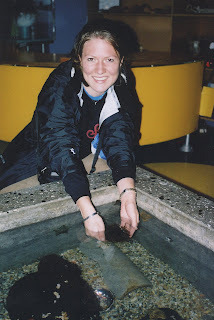 Throughout my years at home, I had fish, canaries, and Charlie! Much to my dismay, I was not allowed to get any other pets! Not that I didn't try! My favorite date with Daddy was to go to the bird store and look at all the beautiful parrots! 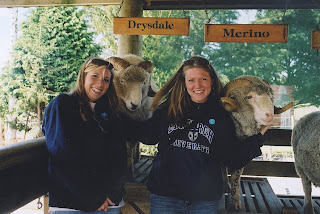 Emily Jochetz and Ashley Suddarth also helped me in my endeavor to have as many animals as possible. Emily and I found a cat with mange in a friends front yard. We took it to the animal hospital and quickly realized that we didn't have the five hundred dollar deposit needed for the cat to be examined, so naturally we took it back to my house! I put it in my room with some milk and tuna and put a note on my door that said, "Do NOT go in my room" and then left to hang out with friends! When I got home, my mother told me that whatever was in my room needed to go outside immediately! I COULD NOT understand why we HAD to put the cat outside! It was gone the next morning and I was so upset! Ashley, Mrs. Suddarth and I also found a turtle! Mrs. Suddarth crawled in a ditch to rescue it for us and . . . of course it came home with me! It lived in the backyard for a while before Dad took it to the Arboretum. I wanted to build it a huge habitat in my bedroom, but had to settle for the "outside" habitat Dad helped me make! From getting to go behind the scene at Sea World to babysitting a litter of pointer puppies for a week, my childhood was filled with animals! Kanakuk brought lots of new animal experiences! 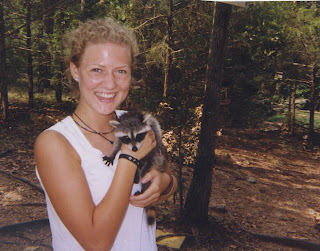 From baby deer, raccoons, and wolf pups, there was always something interesting being nurtured at Kamp! My love of course did not stop when I went to college. When Amy Hardy got chickens for her birthday, she knew who to call! 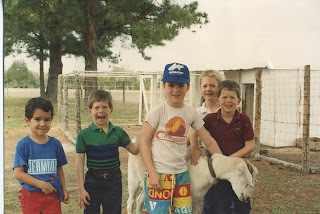 I took them to my parents house and they took care of them until they were too old and had to go to the farm! For some reason, the Lord must have thought it was funny to keep putting chickens in my path because a later year in college David Schwarz had 4 baby chicks he needed to get rid of! Well, of course, I knew where to take them! They were beautiful and turned out to be Rode Island Reds. I named them after the four girls in Lonesome Dove: Laurie, Peach, Clara, and Elmira! It was after I "surprised" my parents with the third set of chickens that my mom gave me the lecture which included, "You may not bring things to our house that breathe without our permission." These were my favorite set of chickens and had such funny personalities! Dad made them a whole roost area outside and every night they would follow each other up the ladder to their branch, where they would cuddle together! Dad would also get a shovel and dig up the compost pile to look for worms. Well, the chickens got to know the routine and when Dad went for the shovel, they came running. It got to the point that he could barely put the shovel in the ground because they were all around his feet looking for bugs and worms! He also, OF COURSE, hand fed them June bugs! My mom even admitted when the chickens had to go to the farm that she missed seeing the colorful birds out in the backyard! 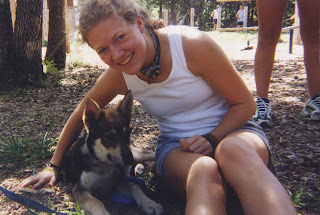 My junior year in college, I lived next to some Sigma Chi's that had two labs! 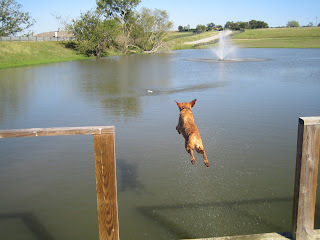 I loved those labs so much and braved running in Cameron Park when I had both of them with me! Duke's personality was a little wary of strangers and I knew if someone ever messed with me, Duke would kill them! 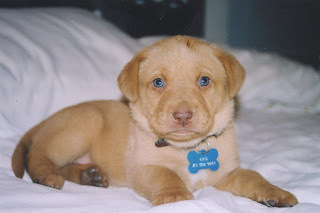 He was a pretty big lab and was red because his parents had been chocolate and yellow. Darla was the sweetest thing! She was chocolate and smaller and LOVED to cuddle! She thought she was really a lap dog. Senior year, I begged Kyle and Cole to let me breed Duke and Darla. I said I would do all the work as long as I could get a puppy! Finally, February 11th came and the puppies were born! I immediately picked out Gus! He was the only "red" boy! 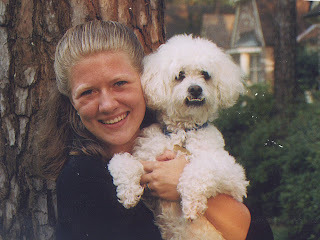 There had been a massive discussion with my parents about me getting my own dog because Charlie was very old and Mom didn't want a puppy aggravating him. Well, the Lord works in mysterious ways and Charlie passed away before Gus was born. So Spring Break, I loaded Darla and the 11 puppies into my Tahoe and headed to Houston! Cole was going skiing over Spring Break and of course I volunteered to take the puppies to Houston with me! Dad had so much fun playing with all the puppies for the week! Mom, thought they were cute, from a distance! :-) When the time came, I finally got to take Gus home and we have been best friends ever since! There is nothing like having a wagging tail and a goofy smile meet you every time you come home! He is so funny and it is debatable whether he like food or being in the water more. . . the jury is still out! 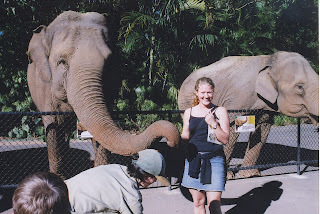 My travels have also led be to some pretty fun "animal" experiences! We got picked to hold the cow in a farm show in Australia. . . I think they knew we were from TEXAS! 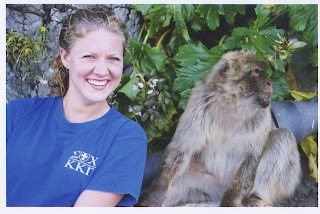 Feeding the monkeys on the Rock of Gibraltar! I will always have pets. Right now, I am limited to Kappa, my Betta, and various fish in my fish tank, and Gus Gus! Gus is my baby and we do everything together! His personality is like Duke's and I can't take him certain places for fear that he will EAT someone! (he is just trying to protect me!) It has been so much fun going through hunt test with him and going with my Dad to watch his progress. My family is obsessed with him! Gus goes to "Grandparent Day Care" every day while I am at work! One of my favorite stories is when Gus was a puppy and Mom and Dad were taking care of him, he had to stay in the laundry room at night time. Parker was home one weekend and felt so bad for him that he slept in the laundry room with Gus all night! Dad is by far the most obsessed! He even takes Gus to the office sometimes! Every morning when I bring Gus to "Grandparent Day Care," Dad gives Gus a biscuit and takes him outside to throw the ball! It is like clockwork! Nothing can ever compare to the love of a dog! One day I would love to own a ranch so I can REALLY have my own Noah's Ark! Can't you just see it!??!! A cow named Norman, two donkeys - Eeyore and Donkey, pigs - Wilbur and Babe, goats, horses, rabbits, cats, and, of course, chickens! I have really enjoyed your blog posts. Great memories, laugh out loud moments AND the best part is that I feel I'm getting to know you better. When you get that Noah's Ark Ranch, be sure to build a little cabin for ME. I'll take care of all the critters while you are working! "'Woodrow, quite a party,' Augustus said."